Before each show Browne gives everyone a sneak peak of whats to come with a sketch. Spring/Summer 15 was accompanied by this: The almost knife-like silhouette paired with the words “Very Sharp” led me to assume that this new runway line was going to be extremely structured with a whole bunch of pointing additions. On June 29, 2014 at around 11:00AM CST, I sat at my computer, anxiously waiting for the show to start. NowFashion’s countdown was ticking away and each moment felt like an eternity. The countdown hit zero and the show didn’t start. Approximately thirty minutes later, it finally began. NOTE: Due to the importance of movement in clothing, I’m reviewing the show based off of this video linked below. The show started with a group of twenty models in five rows of four. They were all wearing clear plastic masks and blindfolds while sitting completely still under a black light. At first, I was a little surprised seeing what the models were wearing. 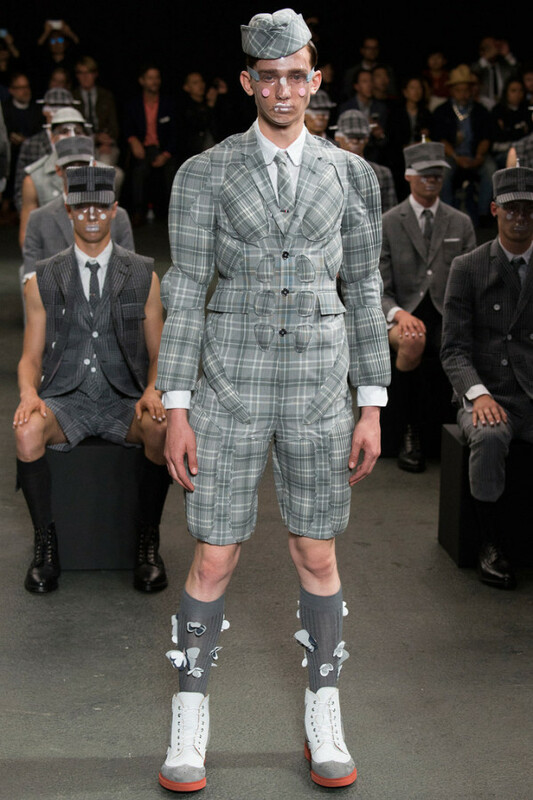 All of the clothing was in a very traditional Thom Browne style, which is the typical grey worsted wool cropped suits. Nothing resembled the sketch at all which confused me. 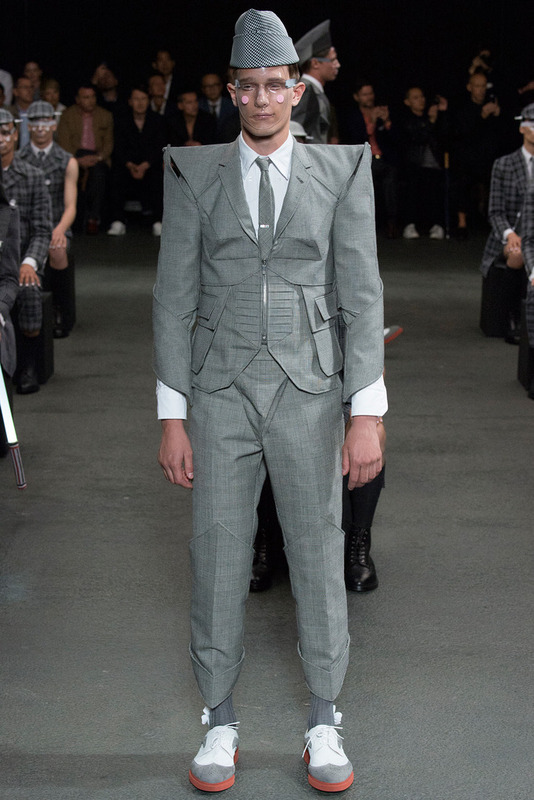 Immediately two models walk out wearing identical suits that resembled the sketch with strong exaggerated and elongated shoulders. My first impression was they looked like tin men. Each holding light sticks, they made their way around the sitting models and stopped behind them. From there they started pacing in between the models almost as if they were slow moving energy currents or patrolmen guarding them. I quickly noticed during the whole show that one by one the guards were taking off the blindfolds of the sitting models. A few seconds later the lights turn on and some ominous music starts. 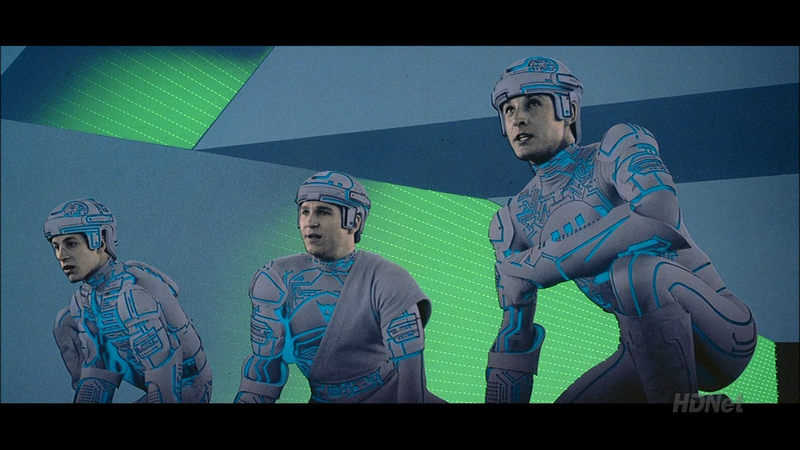 During an interview with Browne he mentions that he took his inspiration for this line from the 1982 movie Tron. The first look’s design must be inspired by the Tron suit worn by all the inhabitants. If you take a closer look, the shoulders are shaped the same in both the look and in the movie and the padded areas are modeled after the circuits. The second look (as well as the looks worn by the models walking through the sitting models) resembles the Tron Recognizer. The sharp shoulders and trimmings of the suits definitely take their form from the hovering vehicle. 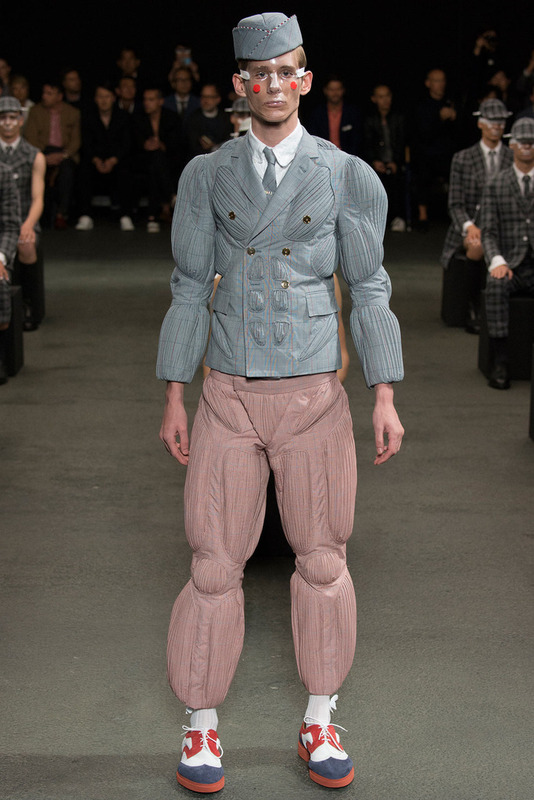 As the models walk you can see the knee caps jut out from the trousers as well. 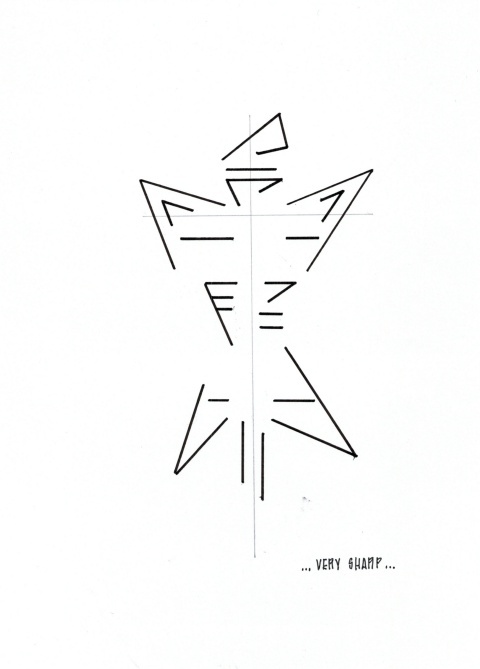 Browne noted that the seated models were robots and enemies of the Puffies and the Sharps. I would consider the two looks above to be the basic template for the rest of the show. Everything else is a variation of these two silhouettes in different colors and fabrics. 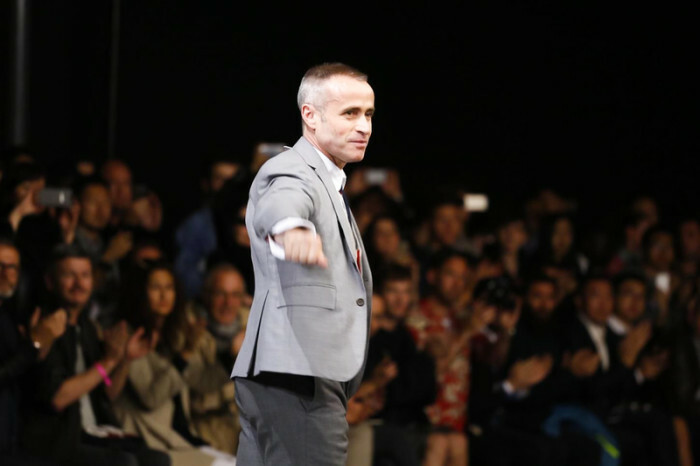 Browne used classics fabrics (wool, seersucker, cotton, tweed and linen) to create his line. What he does well is taking what is known and pushing the limits of what you think is possible. Another thing Browne mentions in the interview is the amount of work that went into creating this line. In order for these garments to hold their their shape, Browne tested out the different fabrics types like mesh and horsehair. Also, one of the jackets had sixty to eighty different pattern pieces to show how meticulous his runway items are. My favorite look of the show is the black Puffies tuxedo. I found the short sleeves and black grosgrain piping interesting and beautifully done. 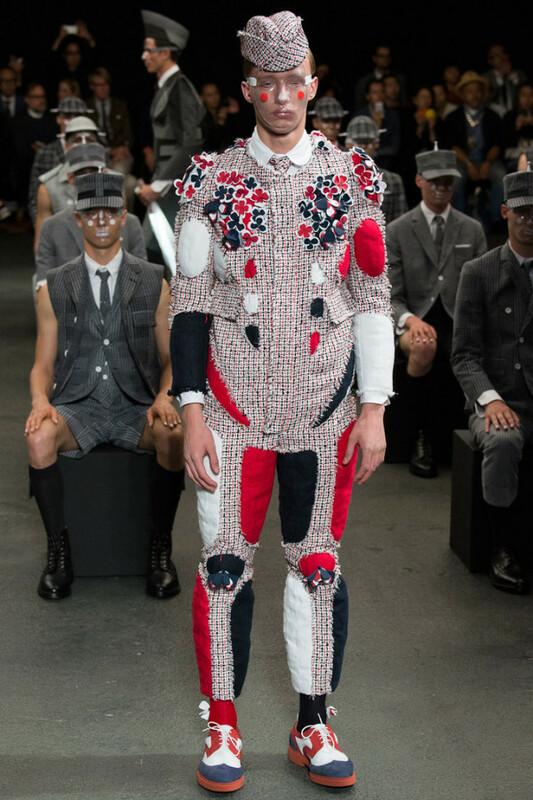 I don’t care for the butterfly on the model’s crotch I do love the use of flowers made of wool as accents. 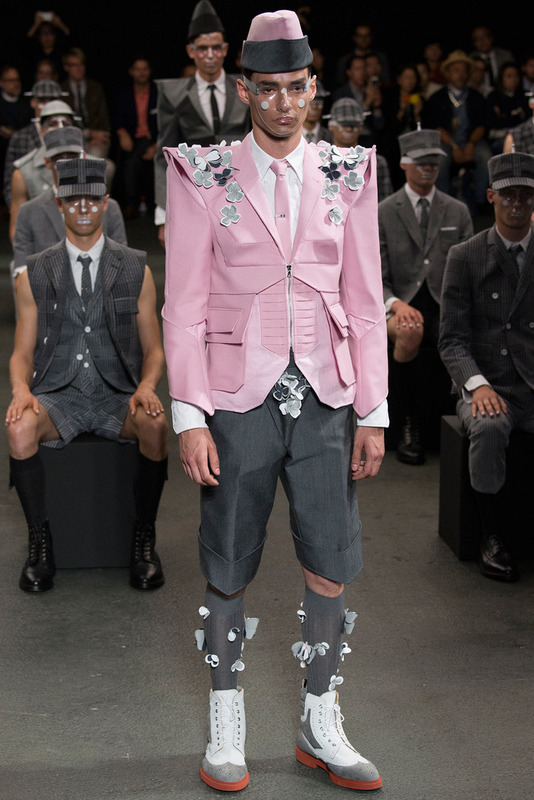 My least favorite look is the grey and salmon windowpane Puffies suit. 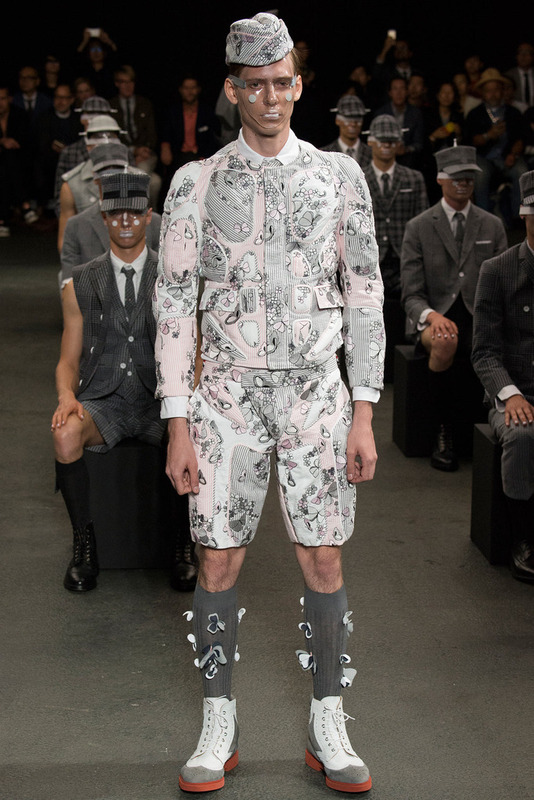 I loved the pattern but the overall look was just distasteful. 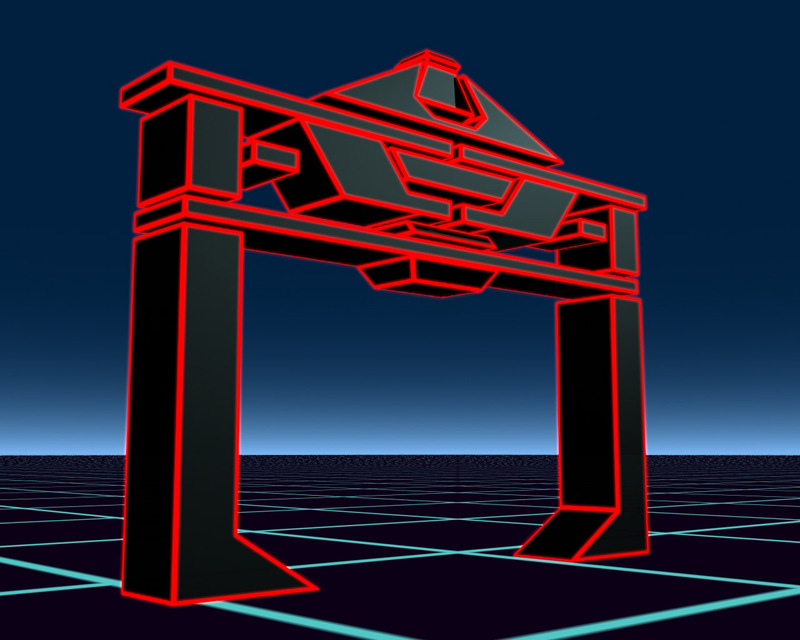 It would have looked better in the Sharp silhouette. In an interview with Hypebeast, Browne says “Every season I try and hope to put ideas in front of people that make them think and, in turn, move things forward.” As the seasons pass the shows are doing exactly what he wants, making people think and moving ideas forward.